Totana.net - Green Light "Youth employment check"
Green Light "Youth employment check"
The Plenary of the Municipal Corporation has approved at the meeting for the month of June a motion by the Department of Public Works and Employment, through which employers who hire unemployed young people aged between 18 and 30 , temporary and longer than 6 months uninterruptedly employment will receive a $ 1,000 check for each worker hired. As reported by the mayor of Training and Employment, Trini Cayuela, the unemployed must be enrolled in the Center for Young Empel Local and Regional Employment Service (SEF) at least three months. 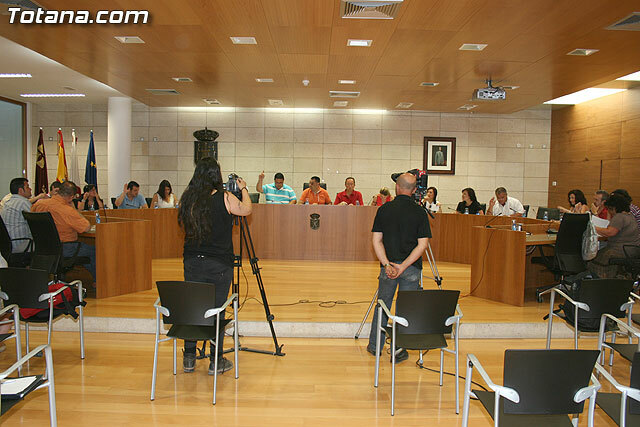 Also, the full City Council of Totana, on New Technologies, has unanimously approved the initiative presented to the creation of a Social Network Social Networks Internet. In the same vein, and the votes against IU + Greens, and with the favorable votes of the PP and PSOE has been approved to improve the coverage of Internet and mobile services in different residential areas of the town. On the other hand, with the votes against IU + The Greens and the votes for PP and PSOE has approved the proposal submitted by the Department of Environment to claim the role of local governments in the protection and management environmental and landscape heritage for its ability to preserve the ways of living in harmony and for their sensitivity and interest in maintaining the best legacy social, cultural and sustainable economic growth to the next generation. Also, corporate have agreed to vote in favor of PP and PSOE and IU abstaining + Greens, the Municipal People's motion to ensure a fair trial cyclist Alejandro Valverde to show their support for policies to combat doping. For its part, has been approved with the votes for the PP and the votes against IU and PSOE + Greens, the counter-opinion presented by the PP to the Municipal Group of IU + Greens, to urge the National Government to promote social dialogue between employers and unions to reach an agreement on the gradual increase in the minimum wage. Similarly, it has given the green light unanimously by all political groups in addition the amendment submitted by the PP to the UI + Greens to seek the face of Grant call 2010 the IMAS, a grant for pay 75% of the cost that would reform the Occupational Center roof "José Moya" for the installation of air conditioning system and for the acquisition of appropriate equipment in the classrooms of the building, which will require the drafting of a previous project. So, among other proposals, corporate have unanimously approved the proposal submitted by the Municipal Socialist Group for the implementation of Law Unit in the Region of Murcia. On the other hand, corporates have unanimously approved the proposal submitted by the PP to analyze the situation of families sobreendedudas, through which it will urge the National Government, in coordination with the Autonomous Communities, to ensure the government sector on social skills necessary funding to temporarily extend emergency assistance or social minimum incomes, and promote a concerted plan shock with the social, economic and financial, as well as the associations concerned to assist families indebted residents in Spain because of the economic crisis. In addition, through this proposal will urge the Government of the Notion to promote the creation of a fund financed by the state and managed by the regional governments to address non-payment of the rental income of residence for people in high vulnerability and victims of harassment social housing, providing for recovery of the sums advanced by the Fund, once the beneficiaries need to overcome the situation which led to the perception of aid.